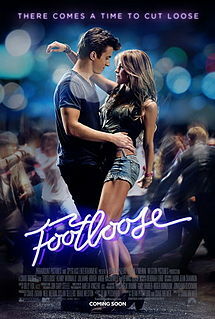 The new Footloose movie, starring Dancing With The Stars alum, Julianne Hough as Ariel Moore, is a contemporary and improved version of the 1980’s original. Loud music and fast cars in the opening scenes of the 2011 version set the stage for the point of the “no loud music, no dancing” laws in the storyline, unlike the original version which takes a while to unfold. Aside from the obvious pop culture differences, the storyline this time around, while mostly true to the original, are more developed, and the supporting characters more involved and more interesting. Quirky standout supporting character, Willard (Miles Teller), has something extra that comes out with his character and will launch him to bigger roles. Teller becomes the best friend to the main character, Ren McCormack (Kenny Wormald), another unknown actor, but Wormald’s great range of emotion and presence on-screen weaves a better story than the original. Sorry Kevin Bacon fans. Earlier-cast stars vacated the Ren McCormack role for various reasons, opening the door for Wormald to shine. Even the parents (Andie MacDowell and Dennis Quaid) are more believable, somewhat realistic, and more likeable characters in this 2011 version. Also added to the 2011 version is a little more action, with an entertaining bus race/demolition derby replacing the mundane and too obvious tractor scene from the original. And taking center stage is the music tieing it all together. The soundtrack received a makeover as well, leaning more country and more contemporary, with remakes as well as new songs. If you go see the movie, beware of the title track, “Footloose”, this time around sung by Blake Shelton. The new Shelton version, just like the old, will stay with you long after the movie is over!